At the heart of the EViews 7.1 upgrade is a new, easy-to-use EViews Add-ins infrastructure that provides seamless access to user-defined programs using the standard EViews command, menu, and object interface. Add-ins offer you an exciting new way of running EViews programs. You may readily define Add-ins that augment the EViews language with user-defined commands, specify new menu entries for point-and-click program interaction, and display program output in standard EViews object windows. Using Add-ins, you can add user-defined features of power and sophistication that are virtually indistinguishable from built-in features. Get started by downloading and installing any of the Add-ins currently available on the QMS website (with the promise of more to come). 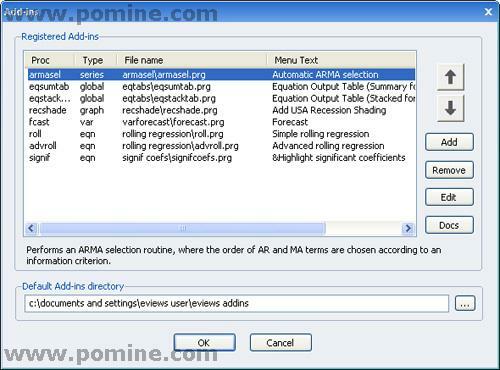 An EViews Add-in is a program which extends the functionality of EViews. Any EViews program file is a candidate to be an Add-in. What makes an Add-in more than just an ordinary EViews program is the degree to which it may be integrated with the rest of EViews. With just a bit of effort, an EViews Add-in may be designed so it is virtually indistinguishable from a built-in feature. * Specify a user-defined single-word global or object-specific command which may be used to run the Add-in program. * Add entries to EViews main and object menus to offer point-and-click execution of the display Add-in output in standard EViews object windows. Once installed and configured, you can use the Add-in just like any in-built EViews routine. Issue an Add-in object command or open an object and select the Add-in menu item, and EViews will run an object-specific program. 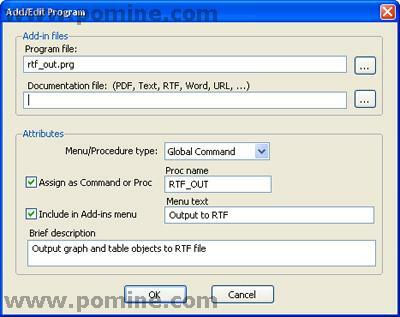 Or enter a global command or select the corresponding main menu item and EViews will run the global program. 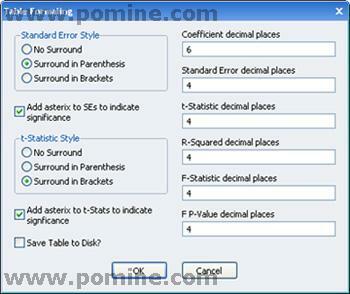 Used alongside new EViews 7 features for creating dialogs and customizing output, the only limit is your imagination. 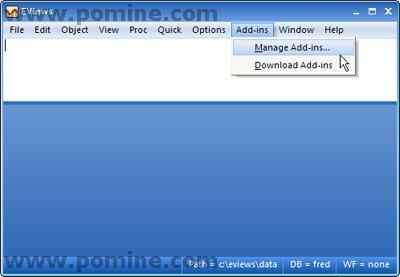 All EViews users may benefit immediately by installing prepackaged Add-ins which add functionality to EViews. A single click is all that you need to download and install any of the Add-ins currently available on the QMS website, with the promise of more to come. to open your browser and navigate to the EViews website where you may read the descriptions of the various Add-ins packages. 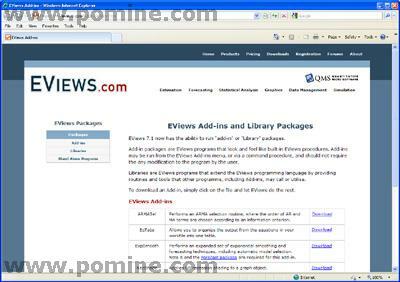 Alternately, you may manually point your browser to http://www.eviews.com/Addins/addins.shtml to display the Add-ins page, where you may examine the currently available selection of predefined Add-In packages. To download an Add-in package to your computer, simply click on package name. Your browser will prompt you to open the file using EViews. Click on OK and EViews will do the rest.